Karma, reaping what is sown, assumption of power, financial success; these are the foundations for the numerology meanings of the enduring and eternal Number 8. As the eighth of all numbers, 8’s symbolism is that of mind over matter. 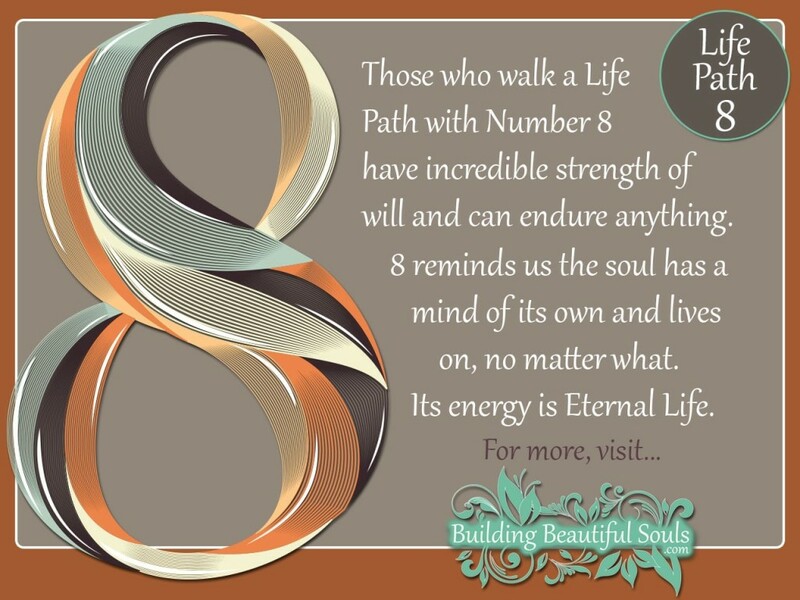 In the spiritual significance of numbers, Number 8 shows us that strength of will overcomes the material world and lives in perpetuity as our ‘will’ is synonymous with the soul. If you have 8 as your Life Path Number, it means that you are the “can do” person. You have a natural knack for making the people around you feel secure in your efforts. This is due in part to poise and self- assurance which walks hand-in-hand with speaking the truth to the best of your ability. The 8 can’t lie (oh they can try, but find themselves totally tongue-tied). Additionally, while 8 does have long-term relationships they are more cut and dry. If you’re a romantic, don’t expect hearts and flowers from the 8 personality cause you’ll get a vacuum. On this life path one of the lessons the 8 must learn is being able to take advice. While their intention is good, if they put down a rule it’s supposed to be law. If others question them they can become quite stubborn and insistent to the point of hurting feelings. When the 8 overcomes this and learns negotiation, things go much more smoothly. Another struggle for 8 in this life is an over-emphasized sense of caution. This means that sometimes they may miss opportunity by over-thinking it. When this happens, the 8 shrugs and says, “one door closed, another will open”. Oddly, in the 8’s life that’s exactly what manifests! In Numerology, 8 represents what might be called the business of BUSINESS. This mystic number, more than any of the others, has an intense focus and drive for success and authority in their career. In this drive the 8 has to tread carefully as it is also the number of Karmic balance. In the 8’s effort to obtain, they must maintain ethics mindfully and not simply ladder climb Those who abuse their power or do anything to obtain their goal (regardless of the impact on others) will find Karma rebounding sure as a boomerang. There are definite dualities in the life and symbolism of an 8. On one hand, you are a “material girl” and love those worldly things that some consider the gateway to all manner of other temptations. What they do not understand is that in the 8’s world money is simply a means to an end. It’s necessary for forward movement. As a result, 8 can even be reckless with money. One day they are rich beyond crazy dreams and the next rubbing pennies together. Nonetheless, 8 always seems to be able to pick themselves up, brush off, and keep going. Some of the most recognizable meanings for the Number 8 in Numerology include drive, detail-orientation, and aptitude. 8 personalities are practical and goal-oriented. Like the number 1, 8 can be quite a powerful leader who is well-spoken and tactful. Those qualities play a huge role in why the 8 is so good at business matters. 8 is not afraid to confront problems however, they do so with such diplomatic grace that the issue’s resolved before people even know what’s hit them. It’s interesting to note that some seekers who know Numerology have gone so far as to legally change their names with the hope that 8 would lead them to fame and fortune. Sadly that intention starts off on a negative foot, often drawing the similarly negative attributes of 8 into the picture like self-indulgence, greed, and hostility. Light-workers advise that you work with the birth numbers you’re given as that is part of your soul and your life lessons. We can look to global symbolism to further understand the 8s nature. It represents Christ consciousness, manifestation, cosmic order (Egypt), Matter, Rebirth, the Universe (China), the sun in splendor (Babylon), farsightedness (Pythagorean) and the path to Nirvana (Buddhist). It is no wonder that 8 has such a powerful impact on a person’s life, and the lives of everyone around them. That’s a lot of energy vibrating in one incarnation. Those with a Destiny Number of 8 have strong wills and even greater drives for success. Your destiny in this incarnation is typically a bright one filled with prosperity and success. Even in times of struggle, like coal under pressure you become the diamond and move positively forward. Sometimes the victorious energetic vibrations of 8 aren’t always tied to money, but rather power – perhaps in leading specific organizations that aren’t necessarily huge money makers. All that success also has a darker twin. Somehow, trouble follows you and seems to lurk at every corner. Part of this has to do with others’ jealousy of your attainments and some is just the Number 8’s nature – it’s often feast or famine. Remember that you are like a cat – you’ll always land on your feet and can endure a lot to reach your goals. If you were a car, you’d have the best shock system in the universe. The child born with a Soul Number Eight is often a bit of an odd bird that people don’t completely understand. These people can make what seems impossible HAPPEN, but they do so quietly (even secretly). Eventually the introvert will come out of its shell temporarily and say “AH HA, look at what I’ve done!” and everyone around them will oooh and aaahh (literally). There’s no question that achievement is in this soul’s future. The spirit of 8 is very dedicated. They will give 150% to anything to which they commit. It’s hard for them to receive however, and that’s one of the karmic lessons of this incarnation. The 8 can multitask but is ultimately happier focused on one project that they can turn into a masterpiece. The wish of Soul Number 8? That history remembers them fondly as a great scientist or politician or …. Well, you get the picture (and the bigger the picture, the happier they become). When the 8 soul takes a darker Path, they become ruthless, putting new meaning in the word “extreme”. So long as the 8 stays in the Light they can be very generous, wise and discerning. With all the attention to business, 8s really need a relationship that keeps them from loosing touch with humanity. They do make excellent partners thanks to their truthfulness and consistency. If you show the 8 praise for his or her efforts, it improves the overall relationship and helps the 8 become more socialized. It also gives them a chance to let out emotions that they often hide from the world. When the 8 has children they become the ultimate providers, sometimes to the extreme. Security and coziness are the keynotes here. If an 8 is having a downswing, they will worry greatly about their children. However, if the 8 has hit its financial stride they’ll enjoy parenting greatly. In terms of leisure they enjoy challenging sports that push them to the limits of their abilities. Balancing this they also like simpler, quiet and contemplative challenges like Sudoku. Back on the home front, as an odd dichotomy the 8 loves new devices, especially those that save time (perhaps so they have more time for work). There may be a number of “honey do” lists for the 8 too – its another way to apply the positive energy of 8. As you might expect the career number is where 8 shines very brightly. While it may take 10 years or more for the 8 to reach a level of authority and success, once you’re there you’ll do well financially and earn the respect of those around you. There are many good choices in job Paths for the 8 including medicine, banking, financial planning, legal services and broker. One caution for the 8 – remember that there is life after work. Leave your job at the office and break loose once in a while. Too much work makes for a very dull, and often lonely 8. In Tarot Card Meanings and symbolism the Number 8 is associated with The Strength Card in the Major Arcana. 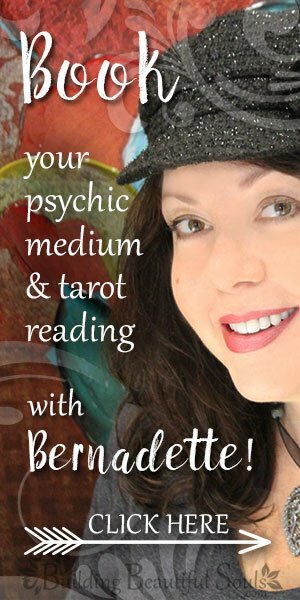 The classic Rider Waite tarot card deck depiction of a woman petting a lion symbolizes our ability to to channel our energies to turn any situation around. Rather than trying to ‘tame’ the lion by brute force, the maiden showers him with love. He responds in kind. Above her head, an infinity symbol (the 8 turned on its side). This card speaks volumes to 8 personalities. When an 8 tames their passions and desires, it becomes strength. If you can “turn” 8, then there is little you cannot achieve. This card and metaphysical number have little to do with physical strength but rather using the mind and will to transform our situations. A well-regulated 8 has the resolve of giants. You are most welcome! And thank you for visiting BuildingBeautifulSouls.com! I am a pieces, (03/05/1989) #8. I am just recently researching numerology in an effort to understand myself better and improve relationships. I am a Manager for a bank…. big surprise right?!?! My Wife Lindsay is a Virgo, #1 (09/14/1985). Have a beautiful baby girl Ruby, who is Gemini (06/10/2016) #7. Looking for tips on how to best build a stronger relationship with my wife and ensure we raise an amazing child together. So many things here make a lot of sense and would be interesting to dive deeper into this. Oooo, that means you are very sensitive and very psychic. Make sure you’re always grounded and energetically protected when in groups of people. I’ll be you do beautiful work on this earth because Pisces and the Number 8 are all about making the world a better place. The same here, with Leo rising, Libra moon, 7 Sun number, 11 Expression and 4 Soul Urge. I am a Taurean woman who’s life path number 8, with my eldest daughter life path number 8, who is also 8 years and 8 days older than her baby sister. Oh and both of my girls were born in July, so my eldest 07/20 and my youngest 07/28. I was born in May, so my bday is 05/05, and our house address is 577. I think it is absolutely amazing, I love numerology and my life path number 8 and all the synchronizes within my life. I really enjoyed reading your meaning and breakdown of life path number 8. Ohhhhh wwwoooowwww! That sure is a LOT of double/master numbers in one family! I’d be curious to know if your family has “out of the ordinary” experiences on a regular basis. Or, as a family, is there a high incidence of unusual careers, achievements, etc? I’m happy you enjoyed reading all about the spiritual meanings of the sacred Number 8! I’m a man born on the 2. october 1979. Does this make me a 2 or 11? Here’s a link to my Numerology Calculator. I always encourage folks to look at all their sacred numbers so they can get a more holistic understanding of who they ‘are’. Based on my understanding, you’re both, which is expressed in 11/2. Read more about this on numerologist.com on repeat numbers. I am a Sagittarius woman, born 12/12/73 and a life path of 8. Is there anything significant being born on the 12th day, of the 12th month? Oh yes! 12 is the number of perfection! There are 12 months in a year, 12 Western Zodiac Signs, 12 Chinese Zodiac Signs and so, so much more! Here is a terrific article about the sacred Number 12. My specialty is psychic mediumship so I would recommend finding a professional Numerologist to help you out on this. I am a life path 8 Cancer.My dad too was a life path 8 …any connections?? When a parent and child have the same Life Path Number it is a very powerful connection – especially with the eternal Number 8. You and your dad must have been very close. As a Cancer, the water in your chart would undoubtedly made you an extremely sensitive and loving child. And not to forget.. future predictions? As a Gemini with an 8 life path number, you have important things to communicate to the world. Gemini’s can tend to say one thing today and a totally different thing the next – so my advice is to make sure all your vocalizations come from a place of authenticity. What’s very interesting is all the water you have in your chart (Cancer/Scorpio). That just makes you (Life Path 8) all the stronger – which is what the spiritual meaning of Number 8 is all about. Plus, you are on the Leo cusp and Leo is the zodiac sign of Number 8! Wow! See, water, no mater how soft, stands the test of time. Water, though it can be evaporated, cannot be worn down. Water does the wearing down (erosion). OK so here’s the thing about all your personality conjunctions – you are FIERCE! Double Leo, 8 for infinity, Cancer & Scorpio for mysticism. You GO, goddess! Hi Bernadette, I’m an 8 and also a Taurus. I’m in a very complicated relationship with another 8 who is a Leo. We communicate very well and understand each other when no one else does. We work really well together and usually we win at everything we start together. Emotionally however, we always hit stumbling blocks. He is very closed off and I am very prideful so we end up in an emotional limbo. Is there any hope for a future romantic relationship between us? Or should we just call it quits? I’m a big believer in hope. So, my opinion is that there is hope for your relationship. That said, maybe it could help to see a relationship coach. If you love each other it might help give you the tools to navigate those choppy emotional waters. I was born 8.8.80. My life is defiantly funny. Wow! A triple 8 and to the 10th power (80). I bet your life story is extremely interesting! Thank you for your beautiful insights! Oooo a Pisces with a Lifepath of 8! Deep. Powerful! You are most welcome! So happy you found insights here! Thanks for visiting and commenting! I have definitely enjoyed reading all of the different meanings of numbers. I am an Aries with a lifepath 8, personality 1, and soul 22. I have had an unusual amount of difficult life situations happen recently and wonder if you have any insight as to what’s going on? Those who have a soul number of 22 (or any number 22) are having a rough go of it right now. 22 is a Master Number. And, as such, when epic earth changes are afoot, 22’s feel them very deeply – and react to them very deeply. Since 22s are always on the path to ascension, they subconsciously create epic learning and soul growth opportunities for themselves. So, take a step or two back. See if you can identify where you should have zigged but zagged instead. Aries will always find sure-footing while climbing their mountain. They just have to listen to their natural instincts. So much valid information in this post. Love it!! Apologies for the tardy reply. Was on vacation. 🙂 So happy you enjoyed reading all about the sacred Number 8! Thank you for taking the time to comment and thank you for visiting BuildingBeautifulSouls.com! I am a Leo 08/03/95 male life path number 8 some of things stood out life has been really sort of confusing in every aspect and been feeling lost more then I ever have , any advice? Insights thanks . When a Leo and those with a Life Path of 8 feel lost, it’s time to be concerned. Leo’s ALWAYS know what they want (because they want everything LOL) and Life Path 8 people are the ‘get it done’ people. That said, Number 8 people also tend to overthink everything – in a BIG way. And, since Leo’s “do” everything in a big way, chances are you’re simply over analyzing way, way, way too much. Start by choosing one small thing to accomplish. Then, put one paw in front of the other and you’ll be back on track in no time! Apologies for delayed reply. The first of the year is always an extremely busy time. First, I am very sorry you and your family are having a tough time. The absolute best advice I can give is to re-read the first paragraph of Numerology 8. Both you and your husband are Number 8. That is incredibly powerful! Together, you have the ability to truly master ‘mind over matter’. Trust that the Universe does not want you to suffer. Any suffering we endure is karmic. Perhaps you and your husband made a Sacred Contract to go through hard time so that you would be better able to appreciate good times that might be coming. Take a deep breath, meditate and clear your chakras, and ask the Universe to send you a clear vision of how best to move forward. The Universe loves you and wants your family to be healthy, happy and abundant. I guess correct but i m always confuse in life…plz I need a suggestion. .. When folks have a hard time getting their life on track, I always recommend they learn all about their Zodiac Sign. Understanding your Zodiac Sign’s traits, personality and characteristics can help you better understand yourself. In this, you might be able to more easily get your life on track. I’m a gemini 6/8/1974, w/a life path 8. Great blog,i enjoyed reading it. Thanks for the kind words of praise! And thank you for visiting and commenting on BuildingBeautifulSouls.com! Hello and Happy Newe Year, Vanessa! Apologies for the tardy reply. The first of each year is always very busy for psychics and then I attended a master mediumship class with the legendary Janet Nohavec. Whew! Quite a January! Thank you for the generous praise about BuildingBeautifulSouls.com. It’s my calling and passion. Also, you might be interested in my sister-site WhatIsMySpiritAnimal.com. Something tells me you’re a true animal lover and I think you’ll enjoy the information there. So, she went through the whole chart and it was like most astrology readings go. There were some great possibilities and some things to ‘pay special attention to’. However, then she got to the asteroids. I’m blanking on the position and name of the aspect of this particular asteroid but the bottom line is that it’s THE most ‘sensitive’ point on your entire chart. And, guess what? The name of the asteroid that governs that sensitive point on my chart is KING! I almost fell out of my chair! His last name is King and now my last name is, too! To me and my astrologer friend, there could be no greater sign from the stars that we were destined to be together. Has it been easy? Heck no! His being a Sagittarius and me being a Scorpio with Sagittarius rising – there’s been lots of locking of horns. LOL But you never saw two people laugh and have a good time more than we do! So, while there are some incompatibilities in our life (he loves hard rock, I love meditation music – he won’t eat any vegetables, I’m a vegetarian) at the end of the day we’re perfect for each other. With so much water in your chart, it’s great you have the Capricorn energy to even it out a bit. I’m curious to know how his Virgo energy plays into the mix but with his Scorpio rising and all your Scorpio-ness I can eassssiiilllyyyy see why you refer to him as your soulmate. Spend as much time as you can in the Scorpio energy and I think all will be glorious! Hello! Enjoyed reading this it really added some fuel to my fire I’m an 8 Born Dec 4 Sagittarius! This urgdges me to make my business moves!!! It’s so wonderful to know that you are inspired! Number 8’s are powerhouse people so go, go, go! You’ll great! Hi Bernadette, I was born in 26/09/1989.Iam libra. Any career advice?? Hi I am a number 8 was born on 30/04/1972 I am new to astrology after raising 3 sons I have started studying alternative medicine. my birth date is 17, with Libra sun and with destiny 4.my life is full of delays,disappointments, failures and embarrassing situations.can you advise something for me. I’m born on the 20th, a Libra/Scorpio cusp with Taurus moon, Saggitarius rising & a life path 8. I have been (suddenly) bombarded with difficult life events since 5 years ago and have been figuring out why, but I guess it’s a karmic period that I have to endure through. Im a life path 8..destiny 4..soul urge 5.im a capricorn born on 12/22/1981..wat does this mean to me?.. I am Sanjay from india, a scorpio, born on 17 November 1969. So both birth no.and life path are 8. Wife is a virgo born on 10th sep 1969 . So her borth no.is 1 and life path is 8 too. Kindly advise and guide for the tips for health , wealth. Fame, success, and relationships . Hello,there.Am I a life path 8 saggittarious??? ?my birth date is 26/11/1987.